‘Here be Dragons’ is often believed to have been written on maps featuring ferocious beasts and mythological creatures to show dangerous or uncharted waters. 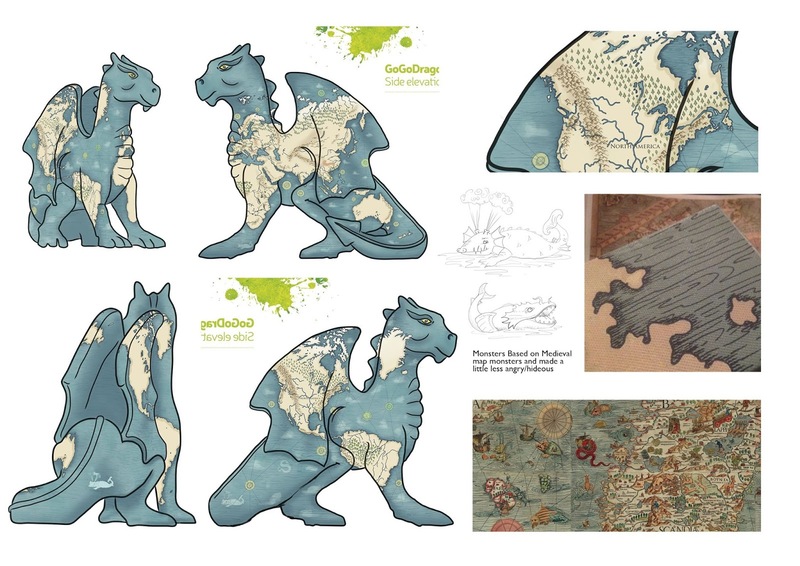 There’s a wealth of monsters on medieval maps from around the world. Many of which are based on whales and other creatures while others are more far-fetched. Dotted around Dennis’ seas are 20+ sea monsters, most of which are inspired by monsters from medieval maps, including Olaus Magnus‘s Carta Marina (1539) and Abraham Ortelius’s 1598 map of Iceland. 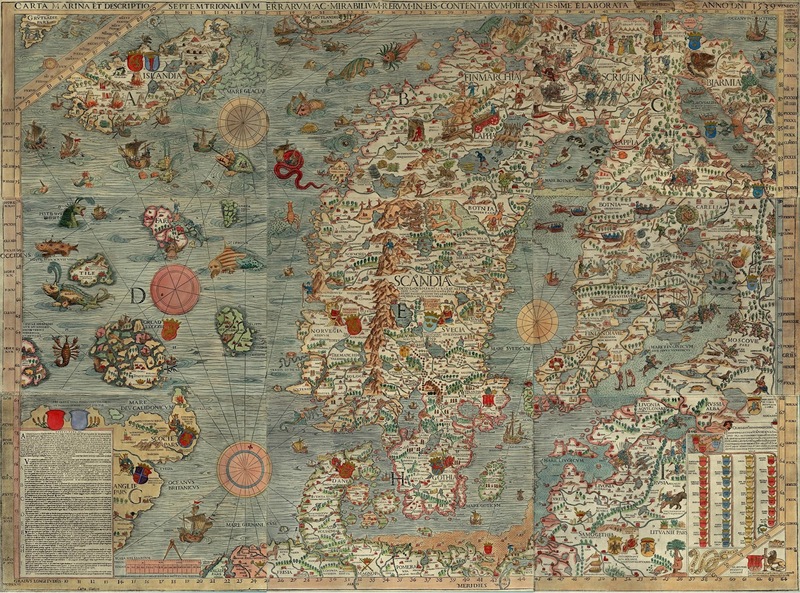 Olaus Magnus’ map became famed for it’s wealth of monsters and activity. I would have loved to have put more and more detail onto my design, but had to be a bit realistic with what I could achieve in the time available. I was always a little worried about the size of the dragons – and where to paint them – they were too wide to fit through my front door. Fortunately my mum offered up her house, so long as I wasn’t too messy. So I got to work with the base coats, and first layers of spray paint at the dragon warehouse. It was a bit chilly, but I got my first sneak peek at some of the completed dragons waiting for their clear coats. To get the word map design onto the dragon I used a projector. I had contemplated doing it freehand, but it seemed quicker and easier to just project my design on, and rough it on with charcoal, altering it to fit as I went along. The more curved edges were a bit of a pain, but we got there in the end. Once the land was all roughed out in charcoal, I went over all the lines with a Posca pen, and washed off all the charcoal. I used an airbrush to go around the edges of the coastlines and make them slightly darker. Now the messy bit was over, we bundled Dennis into the van and took him back to mums house. He looked quite at home in her kitchen. Painting in the land took a little while, I ended up having to do several coats to get a nice even finish on the colour. Once blocked in, I used a posca pen to outline the coastline, put little flecks (akin to the historic maps) around the edges of the sea, and draw in the rivers. Each tree was drawn on, and then filled in. There are coniferous trees in the northern regions, deciduous trees for woodland, and some more tropical trees for the rainforest regions. Each has a shadow on the tree, and a little shadow on the land. I had a few kids atlases to follow for the placement of these, as well as the mountain ranges I inked in with a brush – I was going to use a pen, but couldn’t find one the right colour – in the end the brush worked much better. I airbrushed some deserts and grassland on too. The monsters and ships were all sketched out in a sketchbook to begin with and when it came to placing them, I took my favourites (There wasn’t enough room for them all) and blew them up to the right size on the printer. Using the kitchen window as a lightbox I pencilled up the back on the drawing ready to be arranged on the dragon. I placed all the monsters where I wanted them with blu tak. The placement changed numerous times before I was happy with the composition, some were swapped about, and others were just discarded. Next, I set about tracing them on, going over the lines with a pencil after I’d got the shapes on. Then came the colour – each ship and every monster was painted in. Once all the monsters and ships were on, I plotted in the navigation lines on with string and Blu tak. Drawing them in was pretty nerve wracking, and I mostly used a tape measure to draw along. I then filled in all the sea with little waves in pen. We delivered him back to the warehouse with the other dragons, after taking some photos in the sunny garden. His sponsors Konectbus have been amazing. They ran a competition to name him (I’d been calling him ‘Herbie Dragon’ up until then) and they named him Dennis, after the company who makes their busses Alexander Dennis. He’s now in place near the St Stephens St roundabout, and will be there until the 5th September. 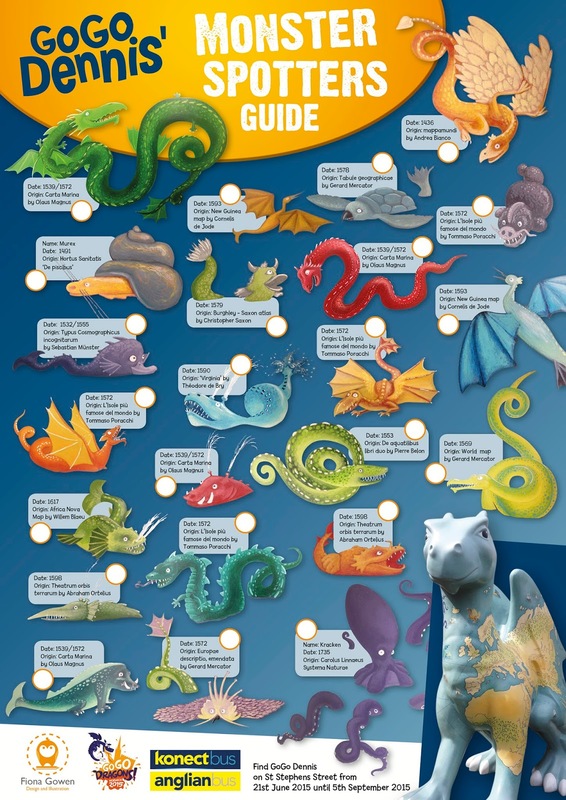 I’ve made him a monster spotters ‘guide too’. It has all his monsters on it, and the map (and date) that they originated from. It’s available to download here, and will soon be available at the bus station as a leaflet too. Previous Previous post: Freelance life – 3 years in.